Originally from New Hampshire, Megan Mitchell has also lived in (chronologically) Alaska, Minnesota, Montana, California and Utah. Megan holds a BA in studio art from Carleton College, in Northfield, Minnesota, with an emphasis in painting and printmaking. She was a studio assistant at Whitefish Pottery, in Whitefish, Montana, and the Hoyman Browe Studio, in Ukiah California. In May 2012, she earned her MFA in ceramics from Utah State University, and was named USU’s Graduate Researcher of the Year. 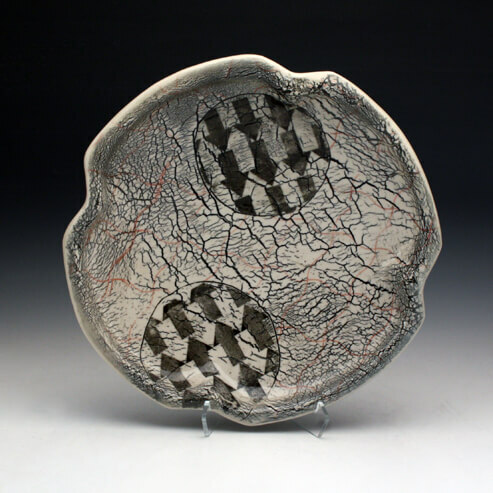 Her work has been exhibited in numerous national exhibitions, and was featured in Ceramics Monthly in December, 2011. In the fall of 2013, Megan will be the Mellon Fellow in Ceramics at Marlboro College in Marlboro, Vermont. Fences, doors and windows indicate an intersection between inside and outside, public and private. These porous boundaries provide enclosure while also allowing access to an outside world. I am drawn to these divisions in space as aesthetic and metaphorical objects, and consider them the point of departure for my work. In my work, I use combinations of structure and landscape to convey the confluence of containment and spaciousness, intimacy and distance. My forms are inspired by architecture and furniture, and are altered to imply movement and instability. I use a repeating vocabulary of forms and patterns in my work, drawn from architecture, textiles and geometry. By reiterating the same shapes in two and three dimensions, it is my intention to create a movement between illusory and actual space. I am fascinated by the ways that my brain filters and interprets the outside world, which then takes root in dreams and the imagination. Certain structures and landscapes hold a specific symbolic power; while completely inanimate, they seem to mirror a part of my inner self. The two dimensional imagery in my work is inspired by objects which spark this resonance.